This Cycladic-style hotel complex faces the Cretan Sea on Perissa Beach and offers traditional accommodation on the island of Santorini. 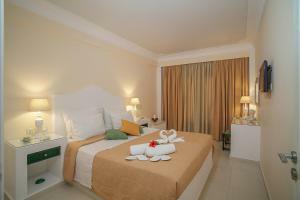 The Sellada Beach Hotel is close to the neighboring towns of Perivolos and Kamari. 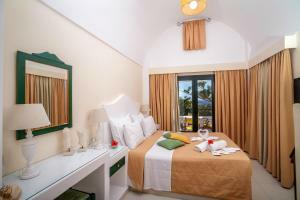 This room is decorated with bright colors and features air conditioning and a balcony with views of the pool or the garden. It also includes free WiFi and satellite TV. This studio has air conditioning, a kitchenette and a balcony overlooking the pool. It also includes free WiFi and satellite TV. Apartment with a kitchenette, a seating area, air conditioning, a balcony, free Wi-Fi and satellite TV. This apartment has a bedroom in the attic, air conditioning, a kitchenette, a seating area and a balcony with views of the pool and the mountain. It also includes free WiFi and satellite TV. This air-conditioned apartment features a kitchenette, a seating area and a balcony or terrace with sea views. It also includes free WiFi and satellite TV. This air-conditioned apartment features a bedroom in the attic, a kitchenette, a seating area and a balcony with sea views. 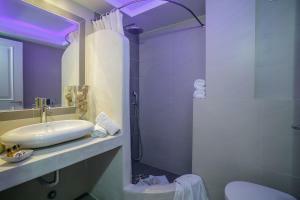 It also includes free WiFi and satellite TV.